We’d like to congratulate Sabar Soundsystem on their appearance at Glastonbury, the world’s greatest music festival, at the end of last month. They took the City Arts Chime with them for a day of activity in Shangri-La. Shangri-La has been one of the many different areas of the Glastonbury festival site since 2009. It is an immersive installation comprising a fictional world, brought to life by a creative team of over 1,500 crew, performers and artists. Each year the area has a slightly different theme. It has morphed from socialist utopia to a dystopian pleasure city, before a viral infection brought about the apocalypse. Since 2013 the theme has been the afterlife. Shangri-La is divided between Shangri-Heaven and Shangri-Hell. 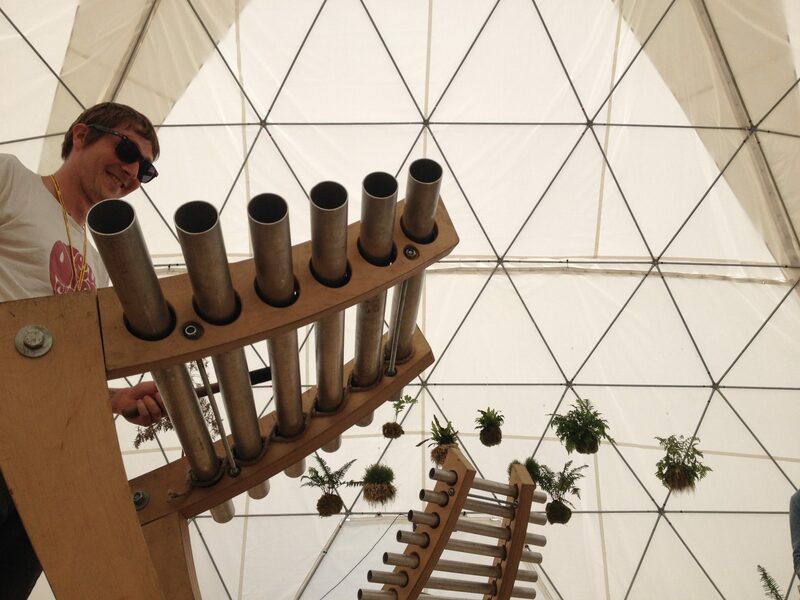 The chimes were in heaven; a chill-out zone for people still up from the night before! In the Heavenly Dome Sabar ran two early afternoon sessions, inviting revellers to join them on the chimes. In the evening they gave a performance of Pentatronix, featuring Si Tew, which was great fun by all accounts.